American Astronomical Society press conference video available at https://aas.org/media-press/archived-aas-press-conference-webcasts (click on "Black Holes and Galaxies Near & Far" from the list). NOTE: the scientific result described in this release is based on a presentation at the 233rd meeting of the American Astronomical Society in Seattle, Washington and published in The Astrophysical Journal Letters (preprint is available here). The research was sponsored by grants from the U.S. National Science Foundation (NSF) Division of Astronomical Sciences and NASA. The National Science Foundation also supports the Gemini Observatory. 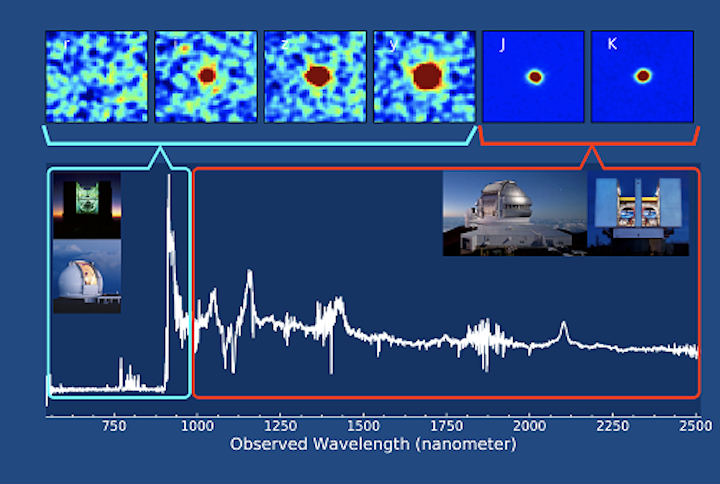 Observations from Gemini Observatory identify a key fingerprint of an extremely distant quasar, allowing astronomers to sample light emitted from the dawn of time. 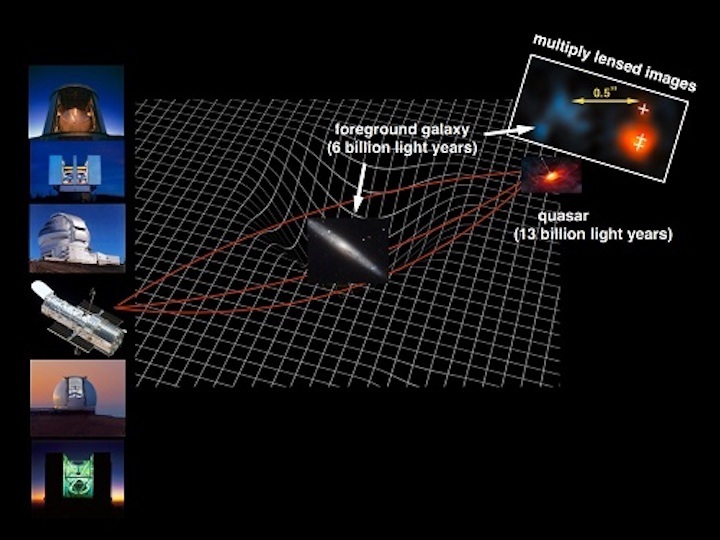 Astronomers happened upon this deep glimpse into space and time thanks to an unremarkable foreground galaxy acting as a gravitational lens, which magnified the quasar’s ancient light. The Gemini observations provide critical pieces of the puzzle in confirming this object as the brightest appearing quasar so early in the history of the Universe, raising hopes that more sources like this will be found. Before the cosmos reached its billionth birthday, some of the very first cosmic light began a long journey through the expanding Universe. One particular beam of light, from an energetic source called a quasar, serendipitously passed near an intervening galaxy, whose gravity bent and magnified the quasar’s light and refocused it in our direction, allowing telescopes like Gemini North to probe the quasar in great detail. The Gemini observations provided key pieces of the puzzle by filling a critical hole in the data. The Gemini North telescope on Maunakea, Hawai‘i, utilized the Gemini Near-InfraRed Spectrograph (GNIRS) to dissect a significant swath of the infrared part of the light’s spectrum. The Gemini data contained the tell-tale signature of magnesium which is critical for determining how far back in time we are looking. The Gemini observations also led to a determination of the mass of the black hole powering the quasar. “When we combined the Gemini data with observations from multiple observatories on Maunakea, the Hubble Space Telescope, and other observatories around the world, we were able to paint a complete picture of the quasar and the intervening galaxy,” said Feige Wang of the University of California, Santa Barbara, who is a member of the discovery team. The intense brilliance of the quasar, known as J0439+1634 (J0439+1634 for short), also suggests that it is fueled by a supermassive black hole at the heart of a young forming galaxy. The broad appearance of the magnesium fingerprint captured by Gemini also allowed astronomers to measure the mass of the quasar’s supermassive black hole at 700 million times that of the Sun. The supermassive black hole is most likely surrounded by a sizable flattened disk of dust and gas. This torus of matter — known as an accretion disk — most likely continually spirals inward to feed the black hole powerhouse. Observations at submillimeter wavelengths with the James Clerk Maxwell Telescope on Maunakea suggest that the black hole is not only accreting gas but may be triggering star birth at a prodigious rate — which appears to be up to 10,000 stars per year; by comparison, our Milky Way Galaxy makes one star per year. However, because of the boosting effect of gravitational lensing, the actual rate of star formation could be much lower. Quasars are extremely energetic sources powered by huge black holes thought to have resided in the very first galaxies to form in the Universe. Because of their brightness and distance, quasars provide a unique glimpse into the conditions in the early Universe. This quasar has a redshift of 6.51, which translates to a distance of 12.8 billion light years, and appears to shine with a combined light of about 600 trillion Suns, boosted by the gravitational lensing magnification. The foreground galaxy which bent the quasar’s light is about half that distance away, at a mere 6 billion light years from us. Fan’s team selected J0439+1634 as a very distant quasar candidate based on optical data from several sources: the Panoramic Survey Telescope and Rapid Response System1 (Pan-STARRS1; operated by the University of Hawai‘i’s Institute for Astronomy), the United Kingdom Infra-Red Telescope Hemisphere Survey (conducted on Maunakea, Hawai‘i), and NASA’s Wide-field Infrared Survey Explorer (WISE) space telescope archive. The first follow-up spectroscopic observations, conducted at the Multi-Mirror Telescope in Arizona, confirmed the object as a high-redshift quasar. Subsequent observations with the Gemini North and Keck I telescopes in Hawai‘i confirmed the MMT’s finding, and led to Gemini’s detection of the crucial magnesium fingerprint — the key to nailing down the quasar’s fantastic distance. However, the foreground lensing galaxy and the quasar appear so close that it is impossible to separate them with images taken from the ground due to blurring of the Earth’s atmosphere. It took the exquisitely sharp images by the Hubble Space Telescope to reveal that the quasar image is split into three components by a faint lensing galaxy.r. The quasar is ripe for future scrutiny. Astronomers also plan to use the Atacama Large Millimeter/submillimeter Array, and eventually NASA’s James Webb Space Telescope, to look within 150 light-years of the black hole and directly detect the influence of the gravity from black hole on gas motion and star formation in its vicinity. Any future discoveries of very distant quasars like J0439+1634 will continue to teach astronomers about the chemical environment and the growth of massive black holes in our early Universe.